STAYING BACK: The women's group led by Nanu Ghatane is reviving water springs that had gone dry. Nepal has always had too much rain or too little. But irregular monsoons and a worsening water shortage are emptying villages in the mountains of Nepal. While scientists try to find proof that weather extremes in the Himalaya are a result of global climate change, here, in Phulbari village 40km east of Kathmandu the real concern is that there are few men left to till the dry red soil. “At least 10 families have left our village in the last few years and migrated to the cities because of the lack of water,” said Nanu Ghatane, who leads a women’s group here. Even as farmers sell their land and move out to Kathmandu, people from the city have bought their homesteads as investment. The terraces lie dry and fallow amidst a stunning backdrop of snow mountains to the north. Even among the families who have stayed, the menfolk have migrated to the Gulf or Malaysia in search of work. “Our men have left to earn Rs 10,000 a month, toiling in the desert heat, while we need to hire people paying them 30,000 a month to work on our fields,” added Ghatane. Laxman Prasad Adhikari, 48, has stayed despite the shortage of water and workers because he earns a decent income from selling milk and vegetables. And the reason he can do that is because he has water all year round from a rainwater harvesting system. He has also built a biogas plant to turn manure from his buffaloes into cooking gas. To be sure, droughts and water shortages are not new in the Himalaya. But farmers here who depend on rain-fed agriculture have had to walk further every day to fetch water. Only 15 of the 65 natural springs in the village still have water. 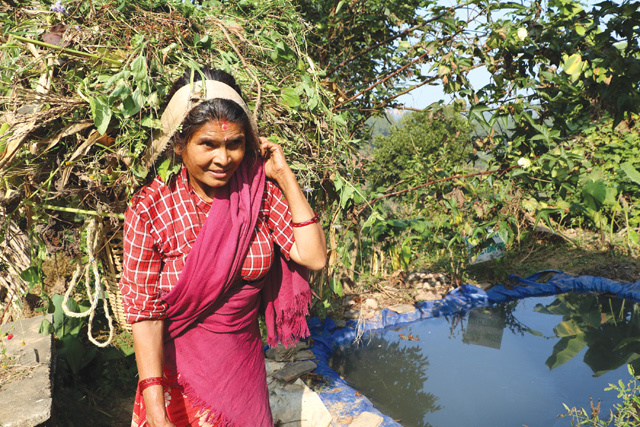 After beginning rainwater harvesting, Laxmi Parajuli has enough water for her cattle and the kitchen of the new home she has built after the earthquake near her tin hut. 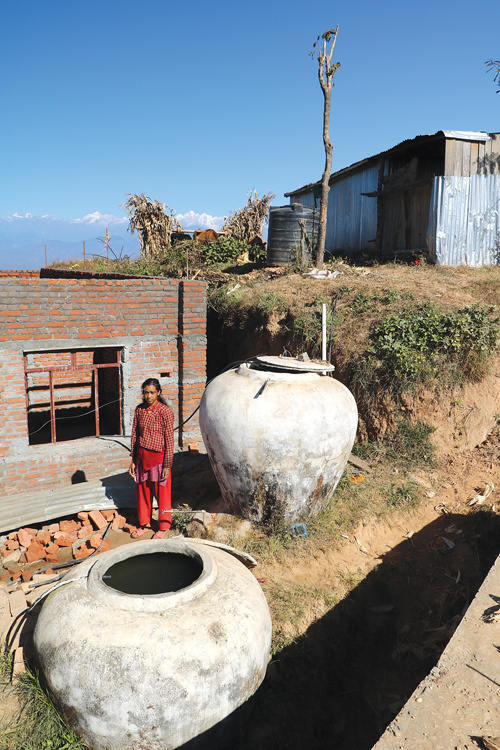 Here in Phulbari and surrounding villages of Kavre, women farmers do not allow a single drop of water go waste anymore. With help from ICIMOD’s Himalayan Climate Change and Adaptation Programme, they are collecting monsoon water, using wastewater to irrigate vegetable fields, and digging ponds to recharge ground water and revive springs. After technicians identify a spring, women build a recharge basin up the hill to collect monsoon runoff and let it slowly seep into the soil. This prevents the spring from going dry, and water is collected in a tank that feeds a tap. Ghatane’s group has revived several springs that had recently gone dry. The happiest farmers these days in Phulbari are the ones who have installed rainwater harvesting systems. 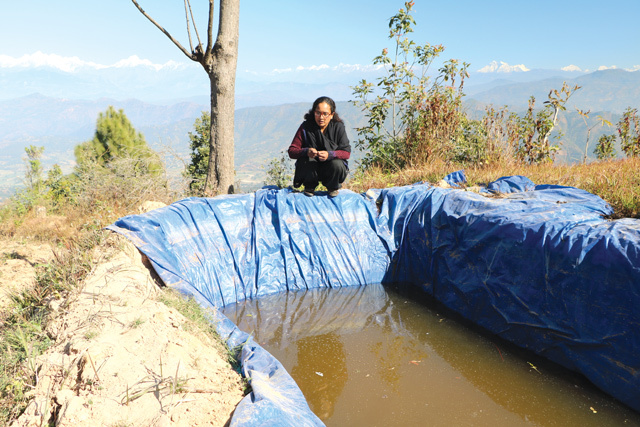 Laxmi Parajuli’s 7,000 litre tank still has water she collected from her roof last monsoon. “Even if the springs dry up, we still have enough rain for the kitchen and cattle,” said Parajuli. Many homesteads here now have plastic-lined ponds to store wastewater. Some families have even built 27,000 litre tanks to store rainwater from one monsoon to the next. The only drawback is the cost, but when there is no alternative and when water becomes so precious for irrigation and drinking Phulbari farmers have found that necessity is the mother of invention. WORTH OF WATER : Nanimaya Dhungana (left), an avid advocate of organic fertiliser, utilises waste water from her kitchen. KALCHHI, KAVRE – In all his 70 years, Gyan Prasad Dhungana has never seen the weather being so unpredictable. Storms are more violent and frequent, and the rain erratic. Decades of sprinkling chemical fertilisers and pesticides have also ruined the soil, reducing harvests, causing ecological harm and making farmers poorer. Now, villagers in Kavre have found that switching to organic vegetable farming can earn more money, help revive the soil, and adapt better to unpredictable weather. Centre for Environment and Agricultural Policy Research, Extension and Development (CEAPRED), which won this year’s the Adaptation at Scale award (see box) has been training farmers in Kavre in organic farming and water conservation so they can better adapt to water shortages. One successful technique is drip irrigation to grow vegetables without wasting even a single drop of water. This protects the soil, boosts productivity, irrigates the fields with limited water supply and makes it much more cost-effective to farm. “We collect rain water and water from the kitchen and washing in plastic ponds, and we don’t waste water at all,” said 54-year old Nanimaya Dhungana, carrying a heavy load of fodder on her back. Dhungana is also an avid advocate of jholmal, an organic fertiliser and bio-pesticide prepared by mixing locally available cattle urine, dung, farm waste and water. Jholmal doesn’t lower the fertility of soil, protects plants from harmful pests and improves productivity. Farmers are also managing locally available compost by covering it up rather than drying out in the sun for maximum benefit. Introduction of methods like mulching and drought resistant seeds have also helped boost productivity of cash crops like cucumber, pumpkin and bitter gourd. The Center for Environment and Agricultural Policy Research, Extension and Development (CEAPRED) recently won the Adaptation at Scale Prize for its successful implementation of ICIMOD’s Resilient Mountain Village (RMV) pilot project. The £10,000 prize was given by the UK Department for International Development for successful climate change adaptation initiatives in Nepal with high potential for being replicated. The RMV approach is being tried out in eight villages in Kavre and works with 40 farmer’s groups made up of mainly women. One of the most successful components of the program is the fertiliser and bio-pesticide called jholmal. "He's from Nepal, the land of Prachanda"